In our last post on investing we outlined how the principle of compounding interest can help an average investor stay ahead of inflation and create a nice nest egg for the future. Today we want to continue with the principle of compounding, but from a different perspective. 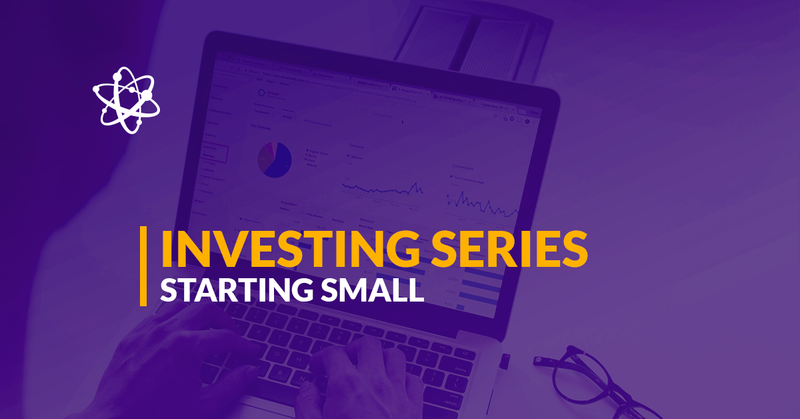 We want to look at how small amounts of money invested regularly each month and reinvested for compounded interest can accelerate your profits in the long run. An average person might think he needs a lot of money (thousands) to start and as most do not have that much, they never begin investing. Fortunately, you can start where you are and invest as little as 50 Euros in short term loans for SMEs on Debitum Network platform. Then, keep on adding that amount each month. Instead of spending that money on coffee, confectionary or similar stuff you can improve your financial future by investing. Small chunks of money create exponential profits over a longer period of time. 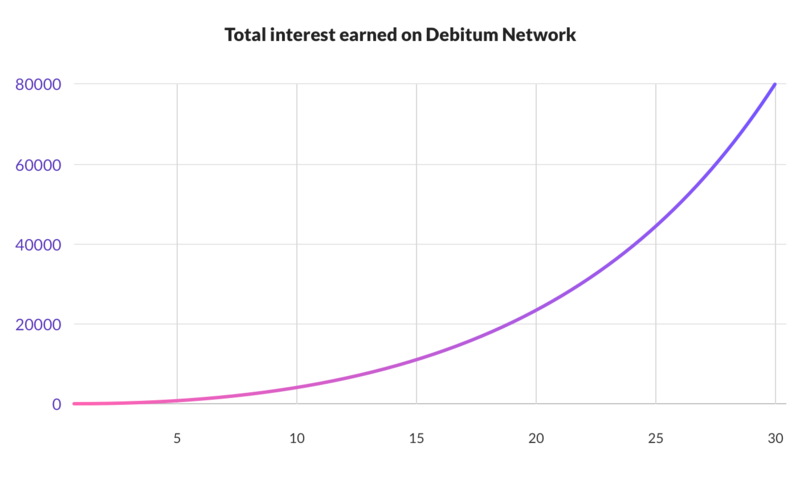 Unlike other forms of investments, investing in the assets on Debitum Network platform allows you to earn compound interest each month. How is that possible? 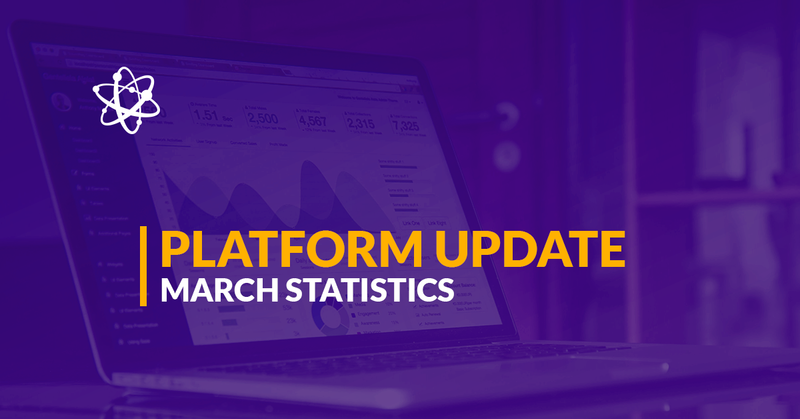 The vast majority of assets uploaded on our platform are short term 1-3 months. The current average annual interest rate on the assets is 9.23%. You can invest your 50 Euros into an asset with 1 month in duration and after the repayment, reinvest the principal, earned interest, plus your extra 50 Euros for the month in other assets for another month. Let’s find out how much interest you would have earned if you kept adding 50 Euros each month on our platform, investing and reinvesting earned profits over the years. The numbers reflect just interest earned. Below is the visual representation of the numbers! From the chart, we can see that the profits start growing slowly in the first ten years of investing in the assets on DN platform, but acceleration picks up dramatically starting from the 15th year of investment, doubling total interest amount every five years. Depending on where you live, the principal and earned interest can be enough for you to live on during retirement. If you start investing with 200 Euros and add the amount every month, you would have enough money to live on after you retire (wherever you live). Earning compound interest in a bank? An average person tends to keep money in a savings account of a commercial bank. That could be a good idea if the interest rates were high and it would be possible to earn compounded interest monthly. Unfortunately, one can only earn compound interest yearly, by keeping money in a bank year after year. 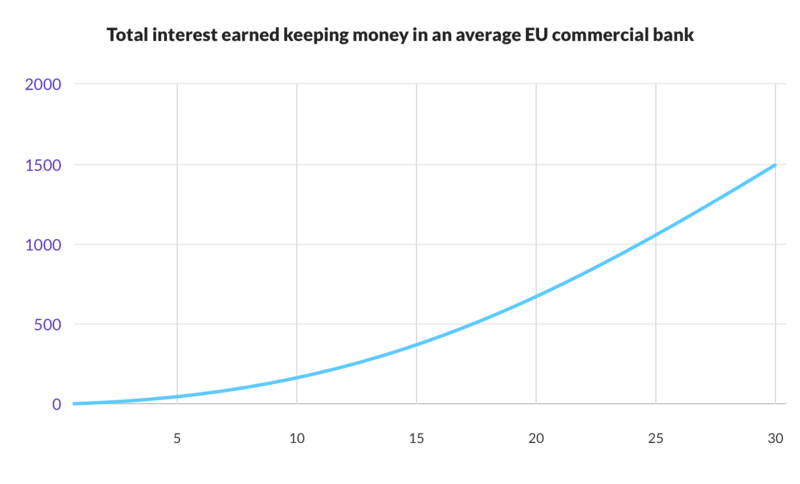 Statistics show that the average annual interest rate for keeping money in a savings account in a bank in Eurozone is 0.53% (among 27 European member states). The number may not stat that low for very long, but it has been pretty stable for over a decade now (since the economic meltdown of 2008). How much interest an average person would have made by adding the same 50 Euros every month on a savings account in a commercial bank in Europe. 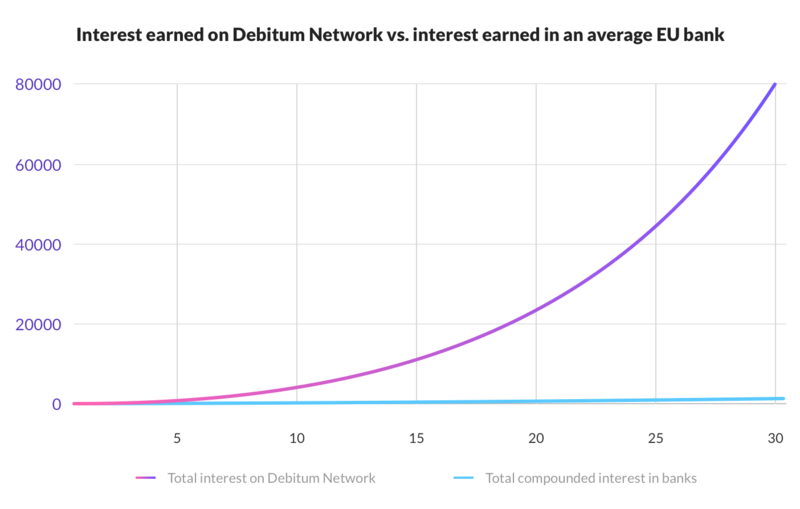 If taken alone, the chart shows a strong upward trend but put it together with the chart representing interest earned on Debitum Network platform over the years and the picture changes dramatically. If you kept putting 50 Euros each month for 30 years to your savings account in a bank, you would have made just 1,548 Euros in interest. The deposit amount would be 18,050 Euros. On the other hand, the same amount invested in short term loans for an average interest of 9.23% and reinvested for a compound interest every month would have made you 79,520 Euros just in interest (and the cumulative amount of your deposits of 18,050 Euros). This is 4 times more than your total deposits within a period of 30 years. That shows the power of compounding, particularly when you can reinvest and earn compounded interest every month, and short term loans in SMEs on Debitum Network platform allows you to do just that. You may object that higher returns also be connected to higher risks. That is generally true, particularly if we talk about investing in financial markets. These are usually considered medium to high-risk investment categories. Fluctuating prices in securities offer significantly higher returns, but with much higher risk due to a number of factors: state of the economy, company returns, general market trend and many more. A company whose share investors owns may go bankrupt and all the investment will be lost as these types of investments are not protected by the government as deposits in savings accounts (typically for the amount of 100,000 Euros). Fortunately, investing in short term loans for SMEs on Debitum Network platform carry significantly lower risks as these investments have additional safeguards such as an independent 3rd party risk rating, a few payback safeguards (buyback guarantee from the loan originator who issued the loan (if the borrower fails to pay off the debt, 90 days after the loan is late the broker has to buy back the loan with outstanding principal and interest), collateral from the business and a personal guarantee from the owners of the borrowing company)). Want to try Debitum Network? We want to invite you to try our platform and see how you can earn compound interest investing in short-term loans. You can open an account free of charge, there are no hidden fees on our platform, and you can stop investing any time you want. Minimum deposit is just 50 Euros, and the minimum investment size only 10 Euros. Ready to invest?